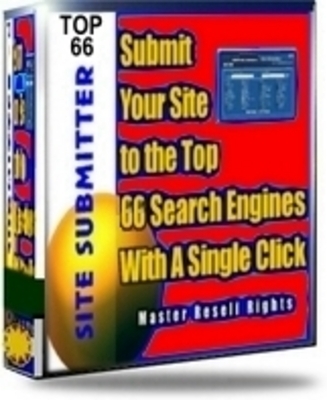 SUPER BONUS: Order now and receive MASTER Resell Rights so you can sell Advanced Site Submitter and keep 100 of the profits! Youll even get a copy of this sales page which you can easily customize to you on adaptations! Our website submission software makes it easy to submit (and then resubmit each month) your websites to 66 of the top search engines. Click a button....wait 10 seconds...and youre done. Dont pay others to do what you can do for yourself! The Software engine Database is constantly updated and always availagble for FREE so you can rest assured your software submissions are always current! When you order today, youll also receive the resell rights, along with the web page and graphics so you can sell The Advanced Site Submitter on your own site. Make just one sale, and youve paid for your investment!